Since the weather has been so gorgeous, we thought we would re-post our feature on one of our favourite patios in the city. Have a great weekend! 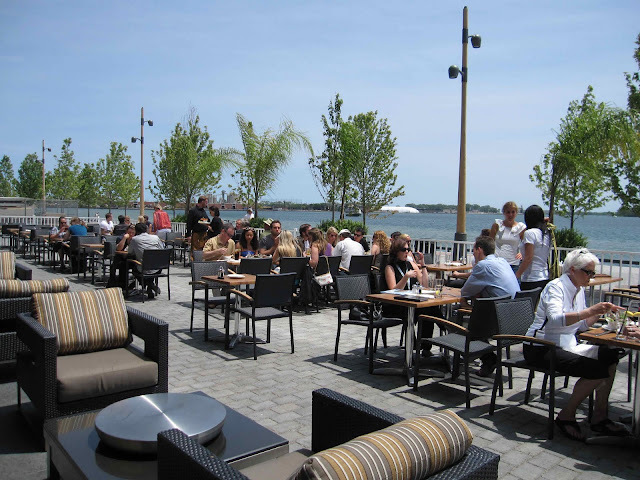 Toronto has just gained an incredible lake front patio at the base of the Corus Entertainment building next to Sugar Beach. 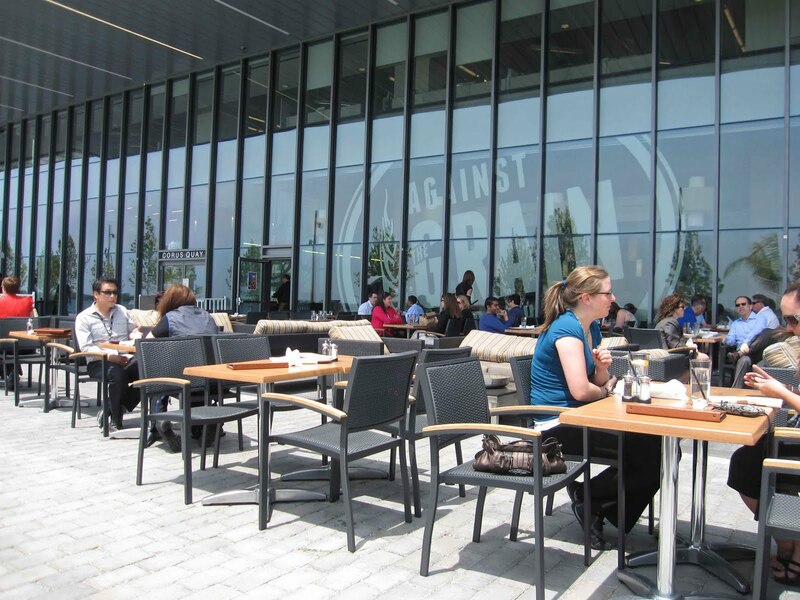 Against the Grain Urban Tavern is the perfect place to soak up the sun with a clear view of the lake and the Toronto Islands. We snagged a spot for lunch and enjoyed a Mediterranean Pizza ($15) baked up in their stone oven. 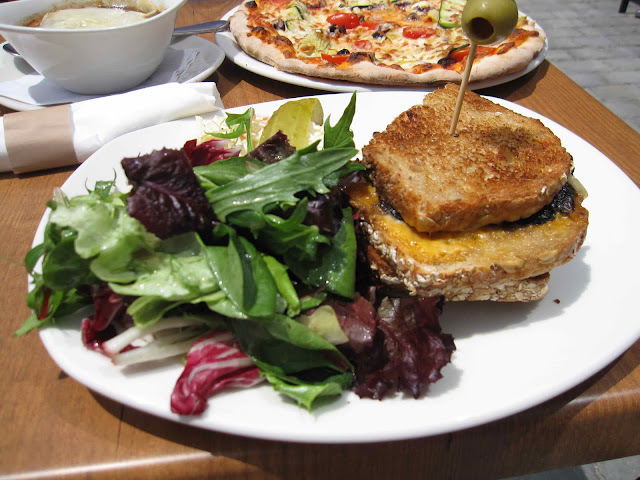 Prices range in the $13-17 for a variety of sandwiches, burgers, mussels, salads and pub favourites like fish & chips. 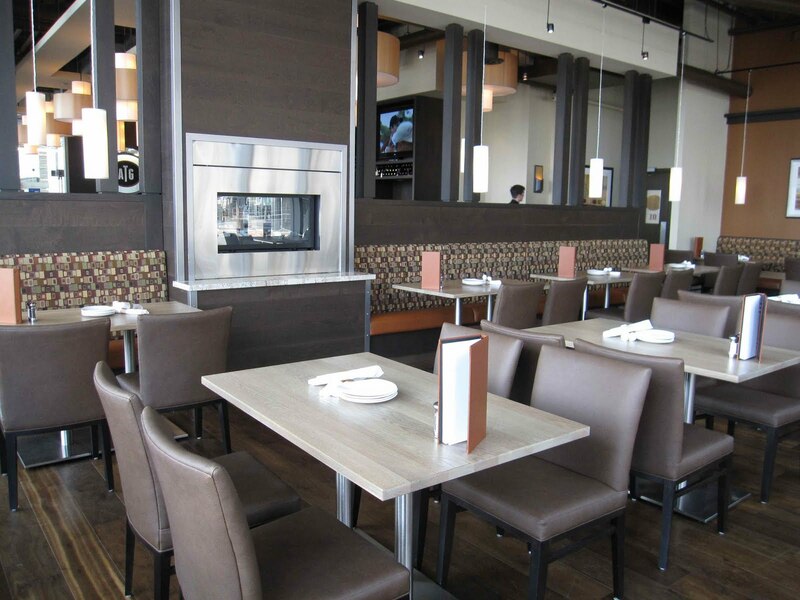 The prices may seem a bit more expensive than your typical Toronto pub, but the food is pretty quality and you're definitely getting a great view. 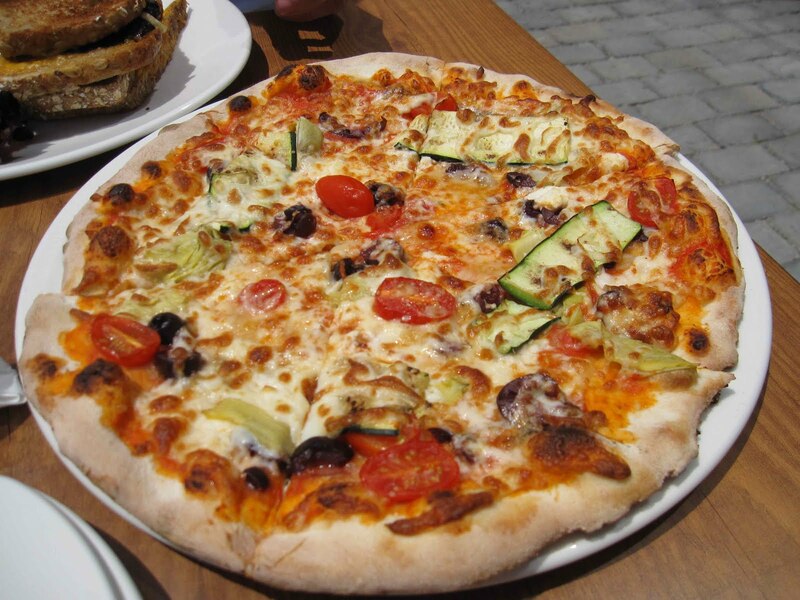 Against the Grain also strives to use local, in-season ingredients whenever possible. It's not a huge menu, but it's focused and the staff are all very friendly. If you're just looking for a casual place to grab an after-work drink, Against the Grain has a variety of European and local brews on tap. They are also offering a brunch menu on Saturdays and Sundays with a $3 Caesar special from 11 AM - 3 PM. We are definitely looking forward to passing the lazy, hazy days of summer here. Big props for the planning department at Corus for thinking of putting a patio here. It's an easy walk for the condo crowd in the area and of course, lots of Corus employees and office workers from other buildings too. We barely had to wait, it's a huge patio with lots of seating. Make sure to check the website for nightly specials too. Portobello Grilled Cheese ($13) with mixed greens, coleslaw and a pickle. Served up with cheddar and brie cheeses on buttery multigrain bread. Would order this again in a second. 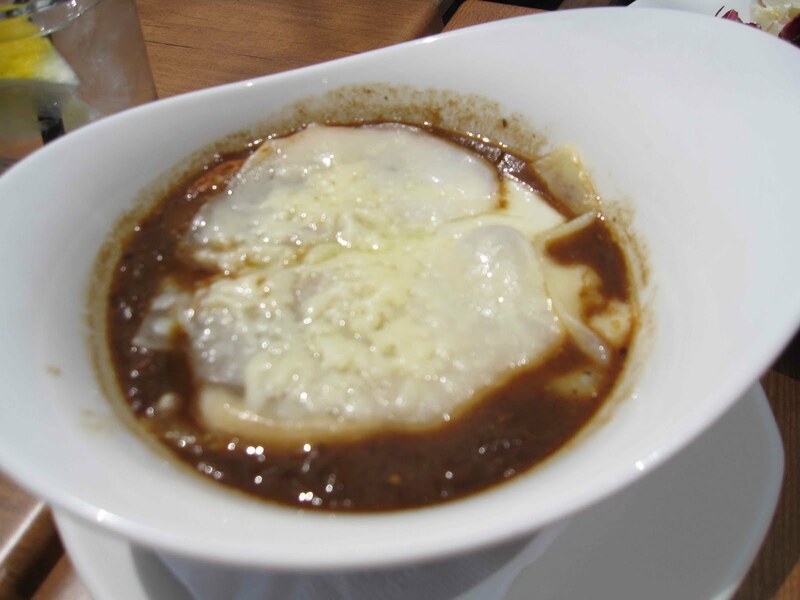 Onion and Ale Soup ($8) - so good and thick, I wish there was more. A hearty dark ale broth for chillier nights on the patio. Garlic crostini floating on top. Not too salty, with a sweet onion finish. 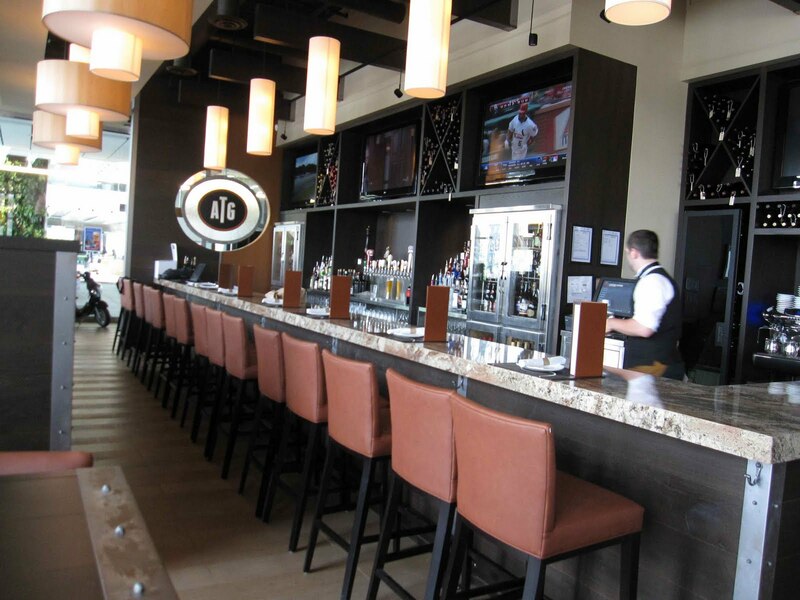 Casual indoor seating and a long bar with TVs and sports. I wish I had a job in the Corus Building. I would eat here all day and ride the slide at lunch.